Russia's President Vladimir Putin and his French counterpart Francois Hollande speak after a news conference at the Kremlin in Moscow, Russia, November 26, 2015. France’s Foreign Minister Jean-Marc Ayrault expressed his regret on Wednesday over the cancellation of the visit to Paris that Russian President Vladimir Putin had planned for Oct. 19. "We were ready to speak with Putin about the situation in Syria. This proposal was made to him, but he had planned to also open an exhibition and an Orthodox church and this would have been completely unrealistic," Ayrault told Europa 1 radio station. "Vladimir Putin refused to come to talk about Syria - this should be remembered, and I regret this as we want to talk about Syria," the French foreign minister said. Kremlin spokesman Dmitry Peskov said on Oct. 11 that Putin decided to cancel his visit to Paris to wait for a "comfortable date" for President Francois Hollande. 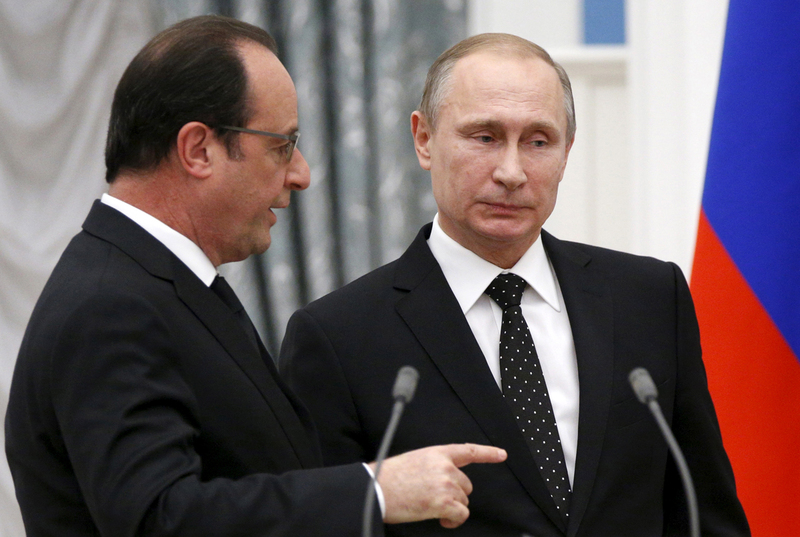 The French leader confirmed that the Russian president "has preferred to delay the visit." "But this will not prevent us from continuing the dialogue," he said.